The city of Houston will mark the two year anniversary of Hurricane Ike this weekend. Our family chose not to ride out the storm in our suburban Houston home. I tend to be very dramatic (like physically ill and crying) during severe weather events and I wanted to get as far away as possible. I was also pregnant. Pregnancy is a wild card that you can throw out for anything, and I'm obviously doing that now. We evacuated to my parents' ranch two days before the storm hit. I packed our wedding album and the computer with all our pictures on it just in case our home was destroyed by the storm. That wasn't a likely scenario, but hurricanes spawn tornadoes and you just never know. Our neighborhood has large trees and they were a real concern. Thankfully, after the storm cleared we returned to a home with absolutely no damage. Our power was restored before we even made it back home. Friends have told us that Hurricane Ike was the scariest night of their lives and that they wished they had left. They described it as being terribly loud. They could hear things hitting their homes, but they couldn't just look outside and see what it was. It was completely dark. Some people in the Houston city limits did lose their homes. Many people were left without power for two weeks. Gas stations ran out of fuel and grocery stores were very low on food. People were acting panicky and it was very scary to see. The damage and loss of life on the coast was shocking. Hurricane Ike is something Houstonians will talk about for years to come. One of the few concerns I had about coming on this trip was the fact that Guatemala is so vulnerable to hurricanes at this time of year. I wondered where we would take shelter if one came and we couldn't get home in time. It actually rained so much last week that the country had devastating mudslides. Nearly 40 people died under the mud and rubble. The first woman we met lost her home. She was very lucky to have escaped in time. 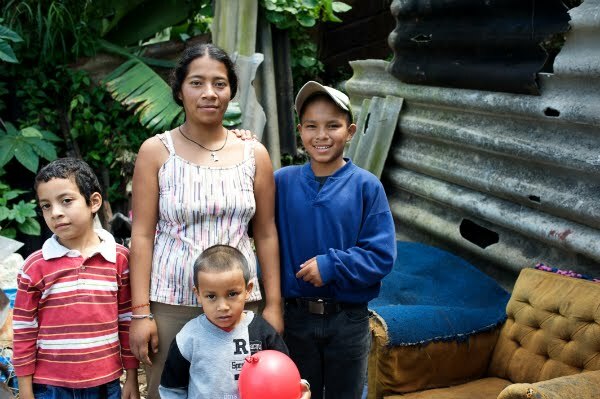 Because her three little boys are enrolled in Compassion's sponsorship program, she had a place to seek help when it was time to rebuild. 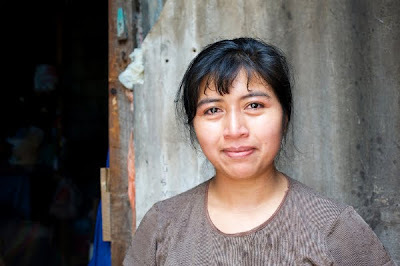 Through their Partners of Compassion fund, she was provided with building materials that her father used to construct a new home for her family. Her children have suffered with post traumatic stress and now they receive counseling at the child development center once a week. By the grace of God, the rest of it remained standing. She wept as she told us about the night she and her family escaped. Now she can't sleep when it rains because she is so afraid. She is oppressed by the fear that she will hear the screams of those whose homes are slipping down the hillside. From the story she told through sobs, this is what I gathered the night to have been like. Picture it with me. It has been raining and raining and it only seems to be getting worse. You finally get word that a hurricane is coming and you need to get out of your very vulnerable neighborhood. You discover that the one and only path up the hill has already been washed out from the water careening down the hillside. It won't be long before the water begins dragging homes down with it. Your only way to escape is to climb the steep, muddy hill in pounding rain. Imagine that the only things you have to hold onto as you climb uphill through a hurricane are unstable trees. Now consider that your three small children are with you. I could only think of how my friends told me that riding out Hurricane Ike in their very well crafted and sturdy American homes was the scariest night of their lives. I could only consider that I hadn't even been brave enough to try. And here I was in the most vulnerable neighborhood I'd ever seen. It was God's grace that any of these families made it out alive. I was listening hard to try to understand this mother's story without the translator's help. One thing I know for sure was that she constantly said "I'm so thankful." She was thankful to be alive. She was thankful for the support of her children's Compassion project. She was thankful for our prayers for her family's continued safety. 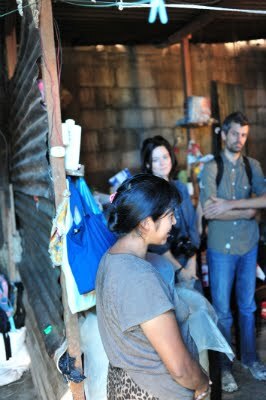 When we took a moment to pray for her, she simultaneously prayed for us, saying "Gracias, Senor." She literally could not wait to express her thanks to God. I've come to the point where I need to tie a nice bow on this story. I don't have it. It must have been swept away in the hurricane. What I do have is this. 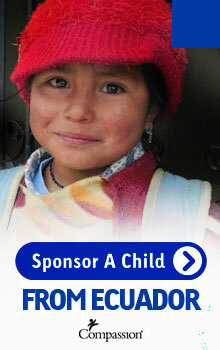 Compassion International is helping some of the most vulnerable children and families on earth. Their intervention is not just an idea - it is concrete. I saw it today with my own eyes. 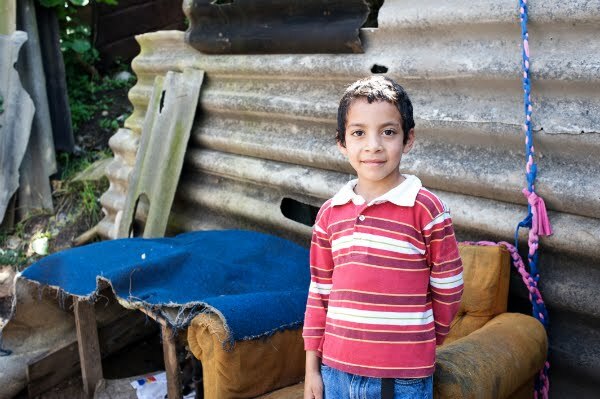 If you have a heart to help these vulnerable children, I would like to invite you to join me in sponsoring a child in Guatemala for $38 a month. I promise you that his or her life will be changed. And so will yours. "Imagine that the only things you have to hold onto as you climb uphill through a hurricane are unstable trees. Now consider that your three small children are with you." That's powerful imagery. I can think of times where I've been out hiking up steep hills on days with perfect weather and it's difficult to have even one child with me. I can't really picture what she went through escaping that hurricane. I left for Ike too and remember well the bizarre world that I returned to of damage, no power and empty grocery store shelves but our worst day here after the storm was still an amazing blessing when the stories like you shared tonight are told. What strong mothers. Wow. I can't even imagine what this mother went through, climbing a muddy mountain with her 3 children, just to survive. We are so pampered here, even in our fears, aren't we? I deal with fear over so many things that pale in comparison to what these people live on a daily basis. I pray God molds each of us through your witness, and uses us to be His hands and His mouth to the children (and the parents) of Guatemala. Thank you Amanda, for letting Him use you this week. 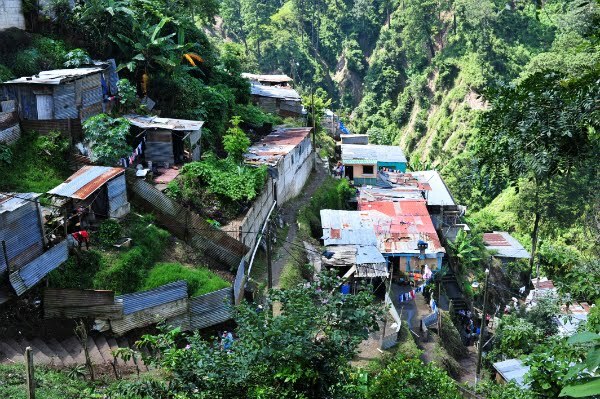 I can picture that perfectly in my mind because my grandmother was part of a village in Puerto Rico just like the one pictured above. 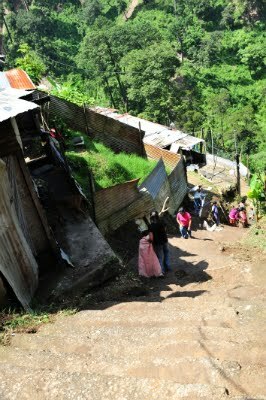 As a girl I climbed dirt paths just like the one in the photo to go play with the neighbors at the top of the hill. I appreciate what compassion does which is why my little Maria in Nicaragua has family here that loves her so very much. 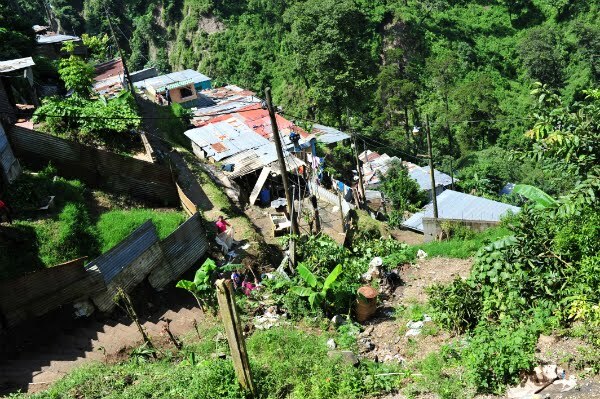 That story gives me the chills - I can not imagine living on that hillside and enduring torture of the hurricane! "Climbing uphill through the hurricane" - yes, I pictured that too and my mind can't wrap itself around what that would be like. In the dark. With our kids. Only Jesus can hold onto us in storms like that. Beautiful, Amanda. I can't even imagine. Writing to our Maria in Mexico right now. What a beautiful story of courage. I will pray for peace for this woman even during the rain. When I think of the stupid things that frighten me compared to her real reason for fear it makes me feel ashamed. What a blessing Compassion is these families. What a powerful story. Thank you for taking time away from you family to share the stories of other families who need our help. Those of us who have never seen it would never know unless you followed the Lord's leading to go. May God bless you for your faithfulness and Compassion for being the hands and hearts of the body of Christ. 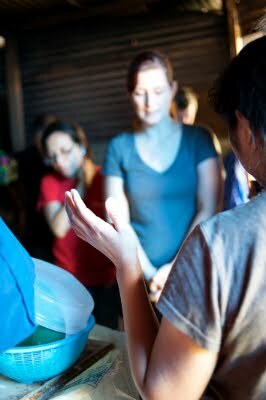 I am reading all of your stories... of what you each saw, received, experienced as you went into these women's homes. I am touched. I am so very very thankful for Compassion International. following your tweets, blog and praying daily. Thank you so much for giving details on what Compassion does for children. I sponsor a child in Kenya and you really give me a better idea of ALL that compassion does for my sponsor daughter. THANKS YOU!!! Amanda, this struck such a tender spot in my heart. I can remember how scared I was during IKE and scared for my baby. And you are so right. We were in a super sound and secure home. And it was SCARY. 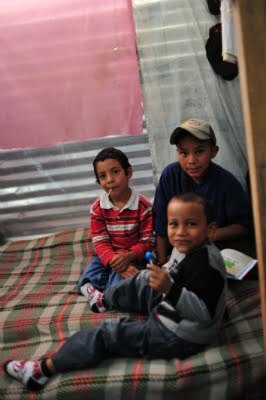 Praying for the work that Compassion is doing for those sweet precious loved children in Guatemala. I loved that you couldn't wrap this story into a neat little bow. Life isn't neat, especially for these precious families. But there is hope and love and even joy. You are painting that picture, Amanda. Thank you. I was on a mission trip in Peru once in a neighborhood much like that one - houses made of tin and cinder blocks on the side of a hill. While we were there, an earthquake happened. It was a very small one - not that it didn't freak me out, because there is nothing so disconcerting as the world shaking - but there was no damage and after about 10 seconds it was over. But all I could think was, what if a serious one hit? All these houses are just made of stacks of cinderblocks!!! Every person in the community would be dead. Why are we here and they are there? From those who have been given much, much will be demanded.